Today we wanted to introduce something a little different, an organ meat, or offal that some of you may have never eaten, or perhaps one that you’ve not eaten since your childhood. We grew up eating calf’s liver, and although it might be an acquired taste for some, we find it to be quite delectable and sweet. We prepare our calf’s liver in a very simple fashion, because we feel that the more flavors are added the more the actual taste and sweetness is lost. Make sure that it is nice and shiny, slightly pink, organic, and fresh. Always buy it from a quality store or butcher. Smell is a good indicator of a livers freshness. It is very perishable so once you buy it, it should be consumed within 48 hours. It can be frozen, but we don’t recommend it. 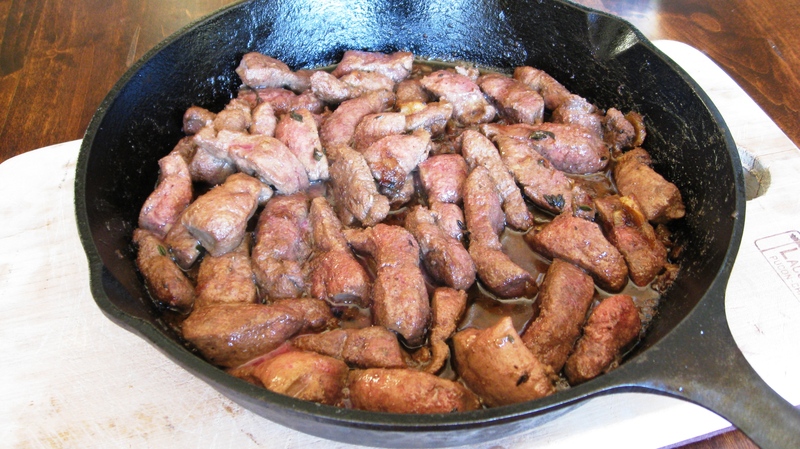 So why should you eat some calf’s liver? It is available year round, delicious, easy to make, and most importantly it contains more nutrients, gram for gram, than any other food! From “The Liver Files” on the Weston A Price Website. We prefer to use a cast iron skillet because it cooks foods more evenly and the pan will not cool off as quickly as others once the meat is introduced. Heat oil in cast iron skillet, add garlic, onions, salt, and pepper, brown until golden and glossy. 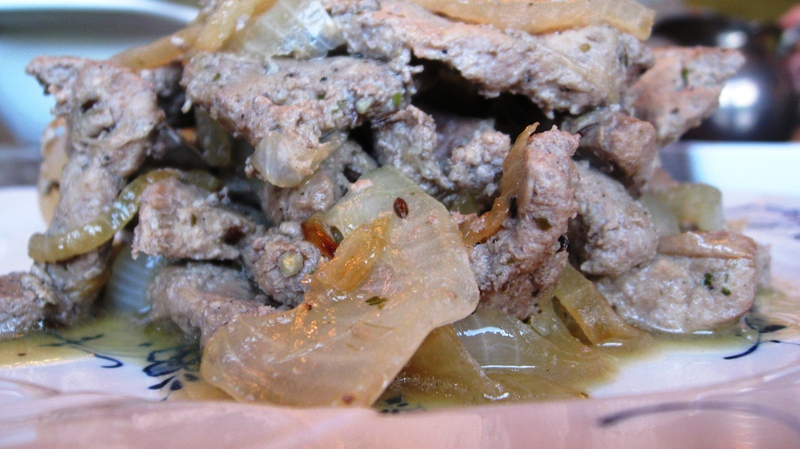 Slice calf’s liver into 1/2 inch strips and toss into pan – cover with onions and garlic. Sautee for about 5 minutes and serve. We had ours this weekend with some sweet potatoes (after a crazy workout) :-), but it is very delicious if served with dark green veggies such as spinach or kale, or even some spaghetti squash. Yummm! It’s a staple in our house and we recommend it to anyone who is a meat eater and loves to live healthy. Go out and get some today! 8 replies to Live-r for life! Wow! I’ve got to try this. We are meat eaters (Paleo babeee) and we love to eat healthy. Great recipes Jo, please keep em coming! Why would freezing liver be bad? The local grass-fed source of my meat only delivers things frozen. Hey Kenny, freezing the liver is not bad. We only recommend it fresh because it is best in taste, consistency and nutrients. Lately we’ve been buying whole calf liver, and we divide it up for several portions, the ones that we don’t eat within a couple of days we freeze as well. We just prefer the fresh plumpness of a never frozen liver. Frozen is perfectly fine. Thanks for commenting! Have a great weekend. BTW – what’s your favorite way of preparing it?